Anand was in his early twenties when we met him. He gave his life to Jesus soon after that. He was shy but always had a big smile on his face. He loved his new family and community. He got jobs here and there cooking and cleaning. He met Mina and they got married and had three beautiful children. 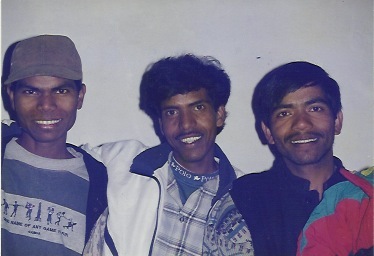 Somewhere and at some stage in their hard lives they found they could write songs in their own Garhwali language. When they discovered that, the songs came one after the other. He was prolific. He was a struggler but a lover of Jesus. A year ago, Anand was diagnosed with cancer. With the help of friends and his community in Mussoorie, he was able to have chemotherapy. Anand went to be with Jesus this morning. 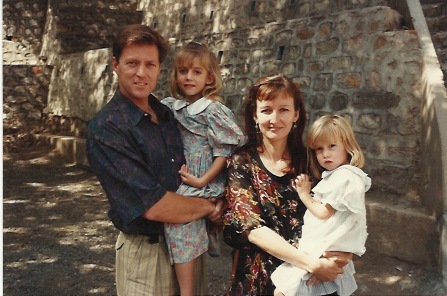 He has left behind his three young children and beautiful wife Mina. Anand met Jesus many years after I did, but he is seeing Him before me. The songs he has written and sung on the earth are nothing compared to the ones he is singing right now. What a son. What a brother. What a friend. What a joy. There was a small church up the road from us. We got to know Pastor S and his family quite well. They were always happy for us to pop in for chai and biscuits. Tony had grown his hair and re-pierced his ear, which caused quite a stir among the pastors. One pastor asked Tony if God told him to grow his hair. His answer was, “It’s strange. I just left it and it grew all by itself.” Pastor S sarcastically shouted out to Tony in the street, “Tony I like your earring!” Tony replied with, “Oh good, I got you one for your birthday!” We had some good laughs. We were sitting in Pastor S’s study one day and looked at the photos that were up on his notice board. They were of him baptising people. We could hardly contain ourselves. He had drawn hair with a blue pen, to cover his bald head. He had also drawn a tie onto the t-shirt he was wearing. It wasn’t a joke. Another pastor came into town for a while. He told us he had a deliverance ministry. He attended some of our meetings and invited us to come to his place for chai. He was very keen to show us his photographs. They were too awful for words. Contorted faces, people writhing around; he was in all of them. We felt really disturbed by it all. While we were trying to look at them with our eyes closed, a lady came to be “delivered.” She fell at his feet. He seemed to know her. He grabbed her by the hair and started shouting at her. He pulled her hair back until she fell on the ground. Tony tried to stay calm, but couldn’t sit there and watch the abuse going on. He strongly requested him to stop and let go of her. He refused and kicked us out of his house. We talked about how, if we were a demon, we would be so terrified of him that we would be more than happy to leave. That was the last time we saw him. 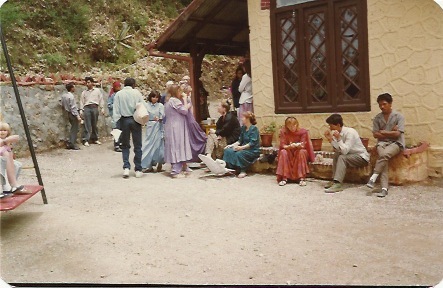 There was a strange religious formality, which we struggled with but we tried to focus on those who weren’t churchgoers. 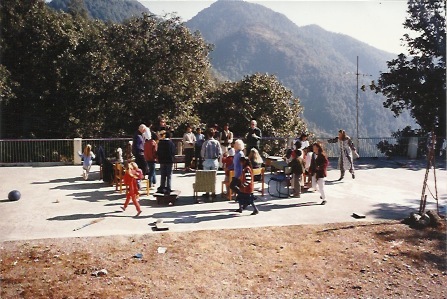 Mussoorie was a small place and everyone knew everything about everyone. It was sad that we got the hardest time from those in the faith. Hiram was a young guy whose father was a Math teacher at Wynberg Allen School. It was on the hill just above our house. He would walk past our place and wave but was really shy. Tony invited him to come to a meeting and he came. He kept coming. One day we were breaking bread and he felt left out. Right then and there he asked Jesus into his life. 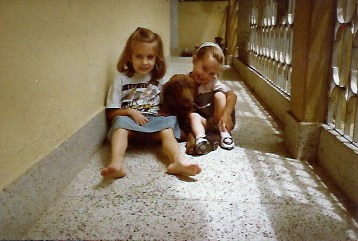 He became part of our family. He told us that for months he had watched Tony playing his guitar and worshipping on the rock on our roof. He had binoculars so he could watch him close up. Tony gave him some guitar lessons and within a few months he was playing really well. Abhinandan was a tiny little man with a big heart. He was one of the best tailors in Mussoorie. Many Woodstock families used him to make their curtains and cushion covers. He was a Jain. We saw a fat, naked Jain man walking past our house once. The girls saw him from the roof and shouted out to us to come and look. They were giggling with Sarita. There were people brushing the road in front of him so he wouldn’t kill any insects. We knew Abhinandan wasn’t that type of Jain. We were interested in what he believed and he was happy to tell us about his religion. He had heard about Jesus through some of the Woodstock people he met. We had a vegetarian meal with him in his little house above his shop. He was a real sweetie. He got really sick one winter and we popped in to see him. I was really scared he was going to die. I looked him in the eyes and said, “ Abhinandan, I want you to come to heaven with us. When we get there, we want to see you there.” He asked some questions about Jesus which we answered simply. He put his hand on his heart and said, “Today I have adopted Jesus.” It was amazing. There were many “weird and wonderfuls” in our lives. People came and went. Checking us out. Some found us weird some found us wonderful. Those who stayed had amazing stories to tell. We were all on a wild adventure together. The day before we moved in to “Ebenezer”, Tony discovered a little chapel right next door. We could see it from our roof. 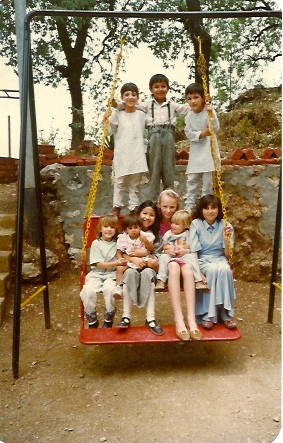 On the same property was an orphanage with about thirty children. He went across to meet the family who were running it. They were lovely and said we could use the chapel for our Sunday meetings. They were also happy for the kids to join us. The chapel could seat about eighty people. It hadn’t been used for years so we got in and cleaned it up. There was also a lovely outdoor space, which we could use for the children. We had some idea of who would come. 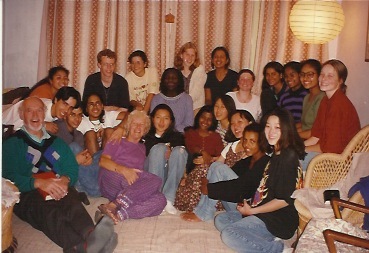 The Bartons, Diane, Shaji, Jason, the Hawthornes, Lizzy, the Bhutia family and some international students we had been meeting with at Woodstock School. They were all going to invite others to come. 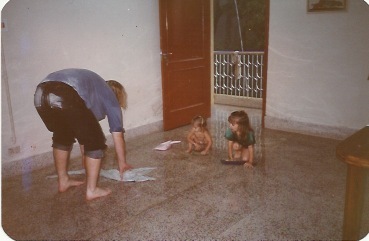 We were also expecting some children and staff from the orphanage. Everyone was excited for our first official Sunday meeting. Some of our young friends from Woodstock at the Barton’s house. 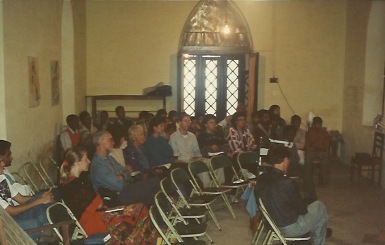 The chapel was almost full. The kids sat on the floor in the front and most of the chairs were occupied. One of the things we were passionate about was wild, uninhibited worship. That was new to the church in Mussoorie. We got the kids up to dance and most of the adults joined in happily. Sonam had helped to translate some songs into Hindi. 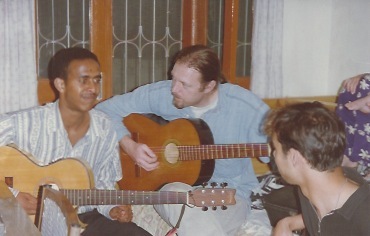 Fini’s songs, “This is the day of jubilee,” and “Oh give thanks” in Hindi, were instant hits. Tony started his series on Nehemiah to inspire us to start building together. After the meeting we all went next door to our house for lunch. Our little kitchen was packed to capacity and there were people everywhere. We were in our element. We decided that our doors would be open to anyone. 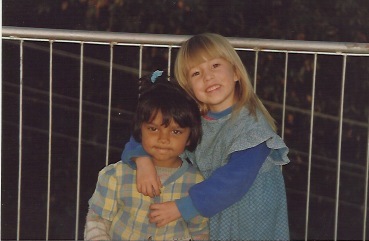 Hospitality was going to be a big part of our lives and our house was going to be filled with people. When we asked God how we were going to do it, He said, “Watch what I’m doing and join me.” So we started to watch. Whoever came to us, we loved, without holding back. If God was working in their lives, we blessed what He was doing and He seemed to do more. People came off the street, ate with us and met Jesus. We kept watching. God kept bringing people who needed a caring community. We could see how important our children were in all of it. Their hearts and arms were wide open to everyone God brought our way. Lives started to change in front of our eyes. Love caused the most downtrodden to blossom and live again. It was amazing to watch. 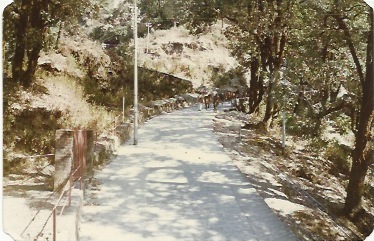 When we arrived in Mussoorie from Goa we still had one-month visas. We had made a connection with music producers in Bombay. They wrote letters requesting that we help them with the distribution of Christian music including Tony’s “Colours” album. When we took the letters to the registration office. The officer wasn’t impressed. He folded our papers up, gave them back and said, “Just do your music and go home.” We were stunned. We knew if we left his desk we would not be allowed back in. The girls were sitting on our laps and we were all beyond tired. We refused to move. We just sat there. We sat while he did his business around us. People came and went and the Johnsons just sat. In the bizarreness of the situation, Zoë somehow managed to undo all my dress buttons while we stared at the officer. Fortunately I noticed before he did. After two hours, he looked up and asked, “So, what can I do to help you?” We couldn’t believe our ears. It was if he was seeing us for the first time. He asked if we knew anyone who could teach Tony Indian classical music. We did. We knew an elderly Sikh man, Ajit Singh who owned Pratap Music House in Astley Hall. His claim to fame was that he had taught George Harrison the sitar. We needed to get a letter from him. With that suggestion we drove for seven hours back to Dehra Dun to Pratap Music House. Ajit was more than happy to help. Then back to Delhi we went. The same officer stamped one-year visas into our passports. We were so relieved and happy. It was another miracle. Tony bought a sitar and went to Ajit once a week for lessons. A priority for us was to get a phone line. We really needed one. We put in an application and waited. In the meantime we gave people the phone number of the orphanage next door. It was an almost impossible situation. If someone called, one of the children was sent to call us. By the time they got to us and we got to the phone, the caller had hung up. Many of the calls were international. Every now and again, men from the telephone department came and hovered around waiting for us to put some money into their hands to do the job. If we had paid a bribe we would have got one in a week. We decided that it was better to wait for a miracle than to pay a bribe. We knew one bribe would lead to another. Those we bribed would have been back every month for more. It would have been a never-ending story. It was two years before we got our phone. Banking was quite a challenge. The closest ATM machine was in Delhi. On a few occasions Tony couldn’t get money from our local bank so he drove to Delhi early in the morning and arrived home late that night. 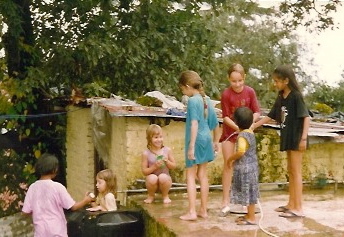 Sarita and her family lived in a small tin roofed room on our property. When we moved in she came down to ask if we needed help. She was heavily pregnant with her first child. Her husband had a maintenance job at a local school. She was lovely and we fell in love with her from day one. Asha and Zoë went in and out of her house as if it was their own. 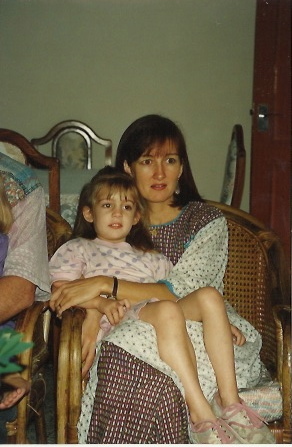 Within a few months she gave birth to a beautiful little girl. We were so happy but they clearly weren’t. There was no wild celebration, just a few cheap Indian sweets to announce that they had a baby. Our excitement helped them to accept and love her. Sarita asked me to name her so we called her Angela or Angie for short. We couldn’t understand why there was no celebration. Angie was so beautiful. She was perfect in every way. She hadn’t done anything to disappoint or anger anyone. She was just a baby. A baby girl. It was our first monsoon in the mountains. There was so much to see. 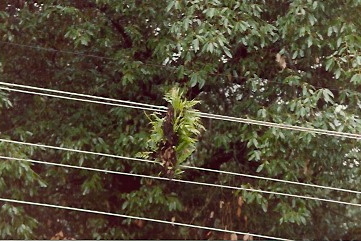 Neighbours told us that the first sign of the rains coming were the little ferns growing on the trees. The girls and I would go for walks and look for them. 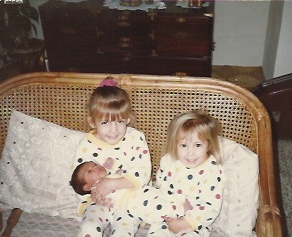 They were so tiny. There was something that looked like an old rag hanging on the electrical wire in front of our house. It was one of those annoying things that ruined the scenery. One day I was looking out of our kitchen window and saw it was covered with bright little ferns. It was so beautiful. Fern growing from dead bark. A picture of grace. Things got greener and greener and the ferns became coats for the trees. The rain was torrential and it poured down for weeks on end. We would lie in bed at night and hear peals of continuous thunder going on for 20-30 minutes. Non-stop. Life had to go on, so we put on our raincoats, grabbed our umbrellas and out we would go. Leeches fell from trees and lurked on the wet paths in the forests. They would attach themselves to whoever walked by and only fall off when they were thumb thickness and full. We carried small packets of salt to sprinkle on them. That made them shrivel up and drop off with not too much blood loss. Once when we were walking through a forest with friends, one attached itself right next to my pinky toe. I was panicking and panicked more when someone got a small sharp stick and tried to dig it out. It was ticklish and painful and I couldn’t keep my foot still. I screamed so loud that the rest of the group came running. They thought I was being attacked by a leopard. The Mussoorie spiders were huge; some the size of my hand (including the legs). Tony managed to kill one and wanted to show me how big it was. I was lying in bed. He took full advantage of the horror on my face and came closer and closer, dangling it right in front of my nose. He was on the bed and I was stuck. He kept shaking it and threatening to put it on me. I kept screaming and he kept laughing. He only realized how scared I was when he heard me crying under the covers. Scorpions were a problem. Fortunately they were quite docile and nobody had ever heard of anyone who had died from a scorpion sting. We were told that the first sting made you allergic to the second one, but we were careful. We always checked our shoes and boots before putting them on. It was uncomfortable just knowing they were around. We got a carpenter to make a clothes rack which we pull-ied up to the roof above our steel bukhari (coal stove). That was the only way to get them dry. We went to bed between damp smelly sheets and the cotton pillows made our faces smell as if they hadn’t been washed in weeks. Our cupboards were damp. Leather belts and shoes grew green moss. Photos left in boxes over too many monsoons were black and cassettes were ruined. When I washed my hair, it stayed wet the whole day. The first sign that the monsoon was coming to an end was that the ferns started going brown. We were thrilled when we spotted the first one. The bright green piece of bark hanging on the electrical wire started going back to its original brown and the sun started to shine again. It was lovely to see it after four months of mist and rain. By that time, everything and everyone had the fragrance of mould. Everywhere we looked, houses were covered in bedding, mattresses, clothes, shoes and people soaking up the sun. We were right there with them. Ash and Zoe in the sun with their new little puppy Sasha.